What an amazing evening! Delicious meal in a beautiful setting. Thank you to Leon and Co. (aka Lighthouse Works and volunteers) for a very special and memorable culinary evening. 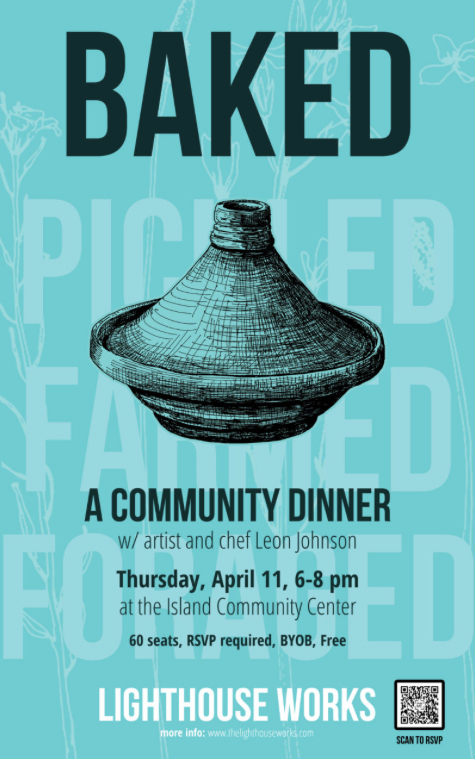 BAKED, is the first in a series of four community dinners, hosted by Lighthouse Works and prepared by artist and chef Leon Johnson, and features a menu of foods that are predominantly baked. Guided by an interest in production, these dinners are part of a broader initiative at Lighthouse Work to realize ways that our kitchen can serve as a resource for both our artists and broader community. 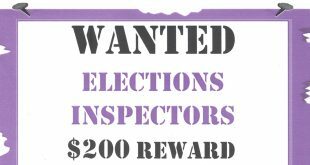 Dinner is 6:00-8:00 pm at the Island Community Center, is free, 60 seats are available, and an RSVP is required. BYOB. Leon Johnson is an artist and chef based in Newburgh, NY. He designs and produces intermedia performances including dinner events, short films, and installations. His studio practice is focused on works on paper and the potential for the form of the book. He works collaboratively in multiple mediums, in the collective conjuring of sacral enclaves. Johnson’s work has been performed and exhibited internationally. He is a recipient of the Pollock-Krasner Foundation Grant for Painting, Fellowships from Yaddo and the Bemis Center for Contemporary Art. He won the Ersted Award for Distinguished Teaching and the Williams Fellowship for Distinguished Interdisciplinary Teaching at the University of Oregon, and was the 2014 Martha Daniel Newell Distinguished Scholar at Georgia College. Recent publishing includes a book edition by Luc Sante through LODGER Press, Sept 2018.
served w/ Onion & Fennel Flatbread, Greens w/ Vinaigrette and Apple Tarte Tatin w’ Whipped Lavender Cream for dessert. Want to help out and learn about preserving lemons? In preparation for the next dinner in this series: PICKLED. We are preserving 42 quarts of lemons. Join us at Lighthouse Works for an hour at 12pm on Wednesday, April 10 and learn the process with us. All are welcome.